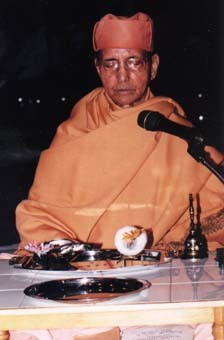 Swami Pramathananda (Dhiren Maharaj) joined the Ramakrishna Order in 1950. After joining the Order, he served mostly in the educational and cultural centers of the Ramakrishna Order in India. He served at the Ramakrishna Mission Vidyapith, Deoghar and joined the Purulia center at the call of Swami Hiranmayananda, the Founder Secretary. He was the Headmaster of the Ramakrishna Mission Vidyapith, Purulia from 1959 to 1962. He returned there to serve as the Secretary from 1969 to 1975. He was one of the most popular Headmasters and Secretaries of the Vidyapith and he was the writer of the patriotic pledge recited by the students daily in the school assembly. Presently he is the chief patron of the Alumni Association of the Ramakrishna Mission Vidyapith, Purulia. He also served successfully in the tribal areas of India. One of these positions was as Secretary and Headmaster at the Cherrapunji center, Meghalaya. From 1975 to 1982, he assumed the post of Secretary and Principal in another English-medium residential school in the tribal province of Arunachal Pradesh. Mrs. Indira Gandhi, the contemporary Prime Minister of India, was deeply impressed with the work and activities of this school when she visited the region. He also had the rare opportunity to serve two Presidents of the Ramakrishna Order, Swamis Vishuddhanandaji and Madhavanandaji, as their Private Secretary. The Headquarters at Belur Math in Calcutta asked him to come to the West in 1982 as the Assistant Minister at the Vedanta Society of Sacramento, California, USA. In March 1989, he came to Canada to take over the charge of the Vedanta Society of Toronto's new center, where he conducts regular services and classes. The Swami, as a Chaplain of the University of Toronto, conducted monthly classes on the Vedanta philosophy at the University. He was regularly invited by different organizations and educational centers to give talks on Vedanta in various cities in Canada, including Montreal, Edmonton, Calgary, Winnipeg and Halifax, as well as some cities in the United States. Swami Pramathananda left his physical body at 8.25 a.m. EST on Tuesday, August 12, 2003 at the age of 83. Click here for an obituary of Vidyapith's first headmaster. Back to Article - Our Vidyapith.